Americans, don't let our brave troops' sacrifices be in vain! Flex up that credit card, do your duty! Consume for your Country! Clutching forks and knives, to eat their bacon!" One afternoon late last September, I caught sight of that day's USA Today, and the front page truly turned my stomach -- not that USA Today's front page doesn't _always_ affect my stomach, given their obsession with Harry Potter, Star Wars, Spiderman, NASCAR -- with a garish spread occupying almost half the front page, containing an "infographic" depicting a shopping bag with protruding items marking the data points on the graph, and containing an article that all but made official what had been unofficial for quite awhile: the idea that we, the "consumers", are actually _expected_ -- actually have a _duty_ -- to go _shopping_! The economy had already been collapsing _before_ 9.11 -- dot-com scam imploding, tech sectors gagging, massive layoffs everywhere -- and there'd always been that hinting around by the CNBC crowd that we were expected to carry the economy by taking on more credit-card debt (especially around Xmastime), but the nearly half-page of rah-rah in USA Today left no doubt: the moneyed chattering ruling classes actually believed that I had a _duty_ to prop them up by taking on more credit-card debt than I could possibly handle, at a time when people are _already_ drowning in credit-card debt, being screwed by their bosses, laid off and such -- but if I somehow found myself in trouble because of all the debt I took on, I can forget any chance of the aforementioned moneyed chattering rulers cutting me a break in bankruptcy court anymore. While the unions and Liberal NGOs fell silent because it was the "wrong time" to speak out, the State, the media, and Capital were telling me to "shut up and shop". Here you see the result of that slow simmering kettle of disgust, indignation and rage. 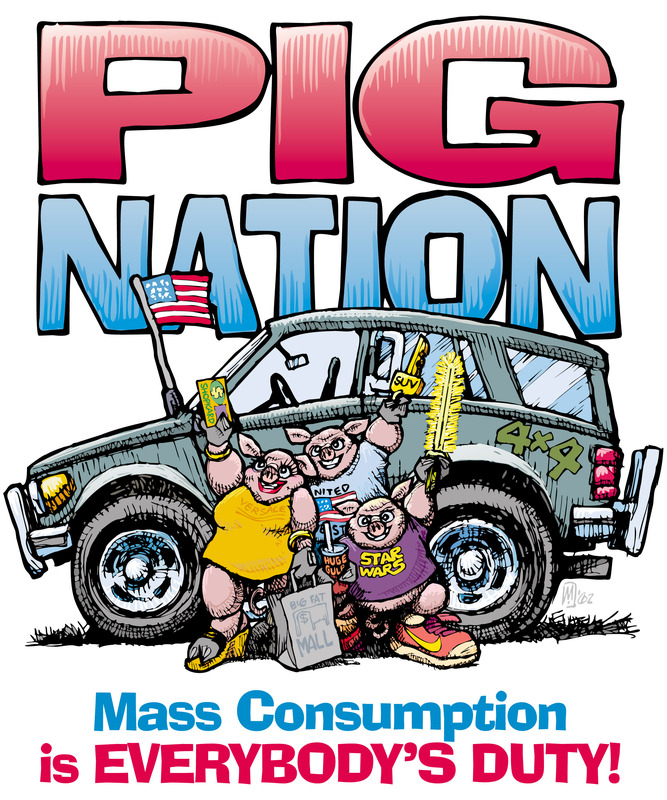 It really is a goddamn' Pig Nation out there.